We recommend you use the editor to add questions although it can be done manually with the following information. Users will remember far more if they have to think about something and interact with the computer by entering the result. It is very simple to add some basic questions into the eLibrary but the resulting impact and effectiveness will more than pay back your effort. Questions can be added within their own module or simply placed at any point within a presentation. This means that you can add a single question at the end of a presentation or groups of questions at any point you wish. You can also use sound, pictures or videos as part of the question. With custom eLibrary versions the question modes can be much more sophisticated and can be made to link with most LMS systems. 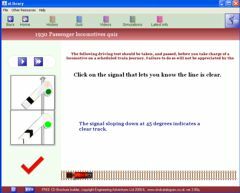 The CD editor includes a quiz generation facility. To add your own interactive quiz you simply need to add the question into the relevant textN.rtf file and then put the answers into a question.txt file using any word processor. Saving the question.txt file in the relevant directory will make the eLibrary automatically display the answer buttons at that point in the presentation. The codes we use to identify each question and answer in the question.txt file are easy. [que3] identifies the answers that will be shown at step 3 of the presentation. You can have 4 multiple choice question buttons in total. res1=1 means that answer 1 is correct although all buttons could give the correct answer if you want. Simply add res2=1 , res3=1 and res4=1 to achieve this (all on separate lines). Sometimes you may want the user to enter a specific word, phrase or number as the answer to the question. This is very simple to achieve. Again the codes we use to identify each question and answer in the question.txt file are easy. For example [que5] identifies the answers that will be shown at step 5 of the presentation. Within this heading you simply need to add match="your answer" and the eLibrary will do the rest.